S/Sgt Dennis Weiskopf (RWG)(10), 1Lt Parley W. Madsen (N)(POW)(11). B-17F 41-24577 Hell's Angels 358th BS (VK-D). Was assigned to the Baldwin Crew on 16 October 1942 at Kellogg Field, Battle Creek, MI and was flown to Molesworth, England arriving on 24 October 1942. On the 4th or 5th combat mission Captain Baldwin remarked on the interphone that he was thinking about a name for the crew's B-17. He asked, "How about 'Hell's Angels' from the movie of that name?" One of the crewmen, commenting on the combat mission being flown stated, "This is the closest to hell that angels will ever get!" The crew then agreed that "Hell's Angels" would be a good name for their B-17. 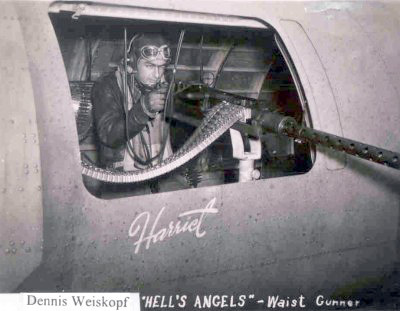 The "Hell's Angels" nose art was painted on the right side of the fuselage in late November or early December 1942 by PFC Bernard K. Kastenbaum. Eighth Air Force Headquarters later issued a directive that squadron and aircraft letters be painted on the fuselage sides of all B-17s. PFC Kastenbaum's original nose was removed and was repainted on the nose by the crew's Tail Gunner S/Sgt Harold E. Godwin. "Hell's Angels" completed 25 combat missions on 13 May 1943 becoming the first 8th Air Force B-17 to fly 25 missions. On 07 January 1944 the 303rd BG(H) adopted the name "Hell's Angels" as the Groups official name. On 26 November 1943 "Hell's Angels completed 48 combat missions. On 20 January 1944 "Hell's Angels" departed Molesworth with hundreds of names scrawled in white paint over the fuselage. Twelve crewman made the flight to the USA with Capt John M. Johnson as the Pilot. Six members of the ground crew, including the Crew Chief M/Sgt Fabian Folmer, were aboard. M/Sgt Folmer had been awarded the Legion of Merit Medal for his achievements as Crew Chief. After arriving at Tinker Field, Oklahoma City, OK on 29 January 1944 where Capt Baldwin met his old B-17, "Hell's Angels" embarked on an industrial morale tour of the USA visiting 18 cities. The tour ended on 19 May 1944 at March Field, Riverside, CA. 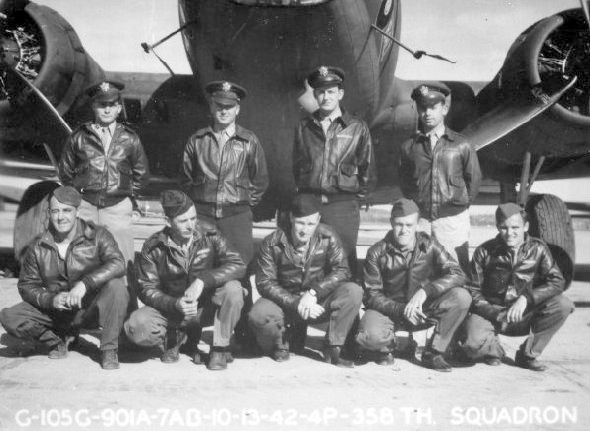 Following the tour "Hell's Angels" was transferred to the USAAF Training Command and was used to proudly train many crews until the end of the war. On 7 August Hell's Angels was transferred to Searcy Field, OK and was finally scrapped. Mike Canale signing "Hell's Angels"
1 (17 Nov 1942), 3, 5, 9, 10, 11, 12, 14, 15, 16, 19, 20, 21, 22, 23, 24, 25, 26, 27, 28, 29, 31, 33, 34, 35 (14 May 1943). All missions were flown in "Hell's Angels" except mission 31 on 17 April 1943, which was flow in B-17F 42-29644 "Jersey Bounce, Jr." 358th BS (VK-C). Capt Irl Baldwin (P) - On 14 May 1943 became the first 303rd BG(H) Officer to complete his 25 mission combat tour. 1Lt Ripley W. Joy (CP) - Mission #1 flew as Left Waist Gunner. Missions 34, 35 (Aborted) 37, 38, 39, 40, 41 flew as CoPilot with other Pilots. Mission #41 flown as Tail Gunner. Was upgraded from CoPilot to Pilot on 04 June 1943. Flew as Pilot on five missions (48, 49, 50, 51 (Aborted), 53) with 1Lt William J. Monahan as his CoPilot. Capt Harold Fulghum (N)(POW) - Only flew one mission (#1) with the Baldwin Crew. Missions 3 & 4 flown as a Lead Crew Navigator with other Pilots. On mission #4, 23 November 1942 to St. Nazaire France in B-17F #41-24609 Holy Mackerel, Major George L. Robinson Pilot, Captain Fulgham was wounded, bailed out over the target and became a POW. Holy Mackerel had been hit by flak, causing considerable damage and making the interphone inoperative. Hydraulic fluid flowing into the Navigator's compartment led Capt Fulghum to believe that the fluid was blood and that the Pilot had been killed. He bailed out in a panic situation. The crew had substitute Navigators on missions 3, 5, 9, 10 &14 after which Capt Fulghum was replaced as the crew's Navigator by 1Lt Parley W. Madsen, Jr.
1Lt Donald R. Bone (B) - Completed his combat tour on 15 May 1943. Did not fly on mission 10. Flew on mission 36 with another Pilot. T/Sgt James E. Rodriguez (E) - Completed combat tour on 17 May 1943. Did not fly on mission 10. Flew on mission 37 as Right Waist Gunner with another Pilot. S/Sgt Harry J. Brody (BTG) - Completed his combat tour on 14 May 1943. Flew all of his missions with Capt Baldwin. S/Sgt Allerton F. "Fred" Meddaugh (RWG) - Completed his combat tour on 21 May 1943. Did not fly on missions 10 & 14. Flew on missions 38 & 39 with another Pilot. S/Sgt Harold E. Godwin (TG). Completed his combat tour on 21 May 1943. Did not fly on mission 10 & 27. Flew on missions 38 & 39 with another Pilot as a Nose Gunner. S/Sgt Dennis Weiskopf (LWG) - Did not fly overseas from the USA to England with the Capt Baldwin Crew and was assigned to the crew at Molesworth. Completed his combat tour on 21 May 1943. Did not fly on missions 13 & 10. Flew on missions 17 & 18 as Right Waist Gunner with another Pilot. Flew on missions 30, 38 & 39 with other Pilots as a Photographer. 1Lt Parley W. Madsen, Jr. (N)(POW) - Replaced Capt Harold Fulghum as the crew Navigator. on mission #9. Did not fly on mission 10 & 14. Flew on missions 39 & 40 with 360th BS Lt Joseph E. Trojan as Pilot. Mission #40, 23 November 1942, was flown in B-17F 41-24602 Yardbird 360BS (PU-A) on a mission to St. Nazaire France. It was disabled by flak over the target and was subsequently hit by attacking FW-190s and ME-109s which caused the B-17 to crash near Pleubian, France. The CoPilot was killed, Engineer died of wounds as a POW and other crewmen, including Lt Madsen, became POWs.